1. The total Electricity Production, driven by total demand, which is a factor of individual patterns of consumption and population sizes. Economic development and population growth are the primary drivers of electricity demand, which itself drives total electricity production. The growth of per-capita electricity consumption is strongly correlated to economic development, a pattern that all countries of the region share (see figure 3). However, as demonstrated in figure 3, the evolution of per-capita electricity consumption with economic development in the region’s countries has historically followed different paths. This evolution has been driven by four major factors: the nature of economic activity (mainly the scale of energy-intensive industries), the dominant climatic conditions, the system’s energy efficiency, and tariff rates to different electricity end-users (commercial, residential, and industrial). In the Levant, Countries such as Jordan, Lebanon, Syria, and the occupied Palestinian Territories have consistently had lower levels of per-capita electricity consumption for similar levels of economic development as other countries of the wider region. Such low levels of per-capita consumption are mainly attributed to two structural factors: first, the Services and Agriculture sectors have remained dominant in the economies of these countries over the past decades – services accounted for 72% and 66% respectively of Lebanon’s and Jordan’s GDP in 2010, while In Syria, Services and Agriculture accounted for 46% and 23% respectively of the total GDP in 2009. both the Services and Agriculture sectors have lower electricity demand requirements compared to energy-intensive industrial activities. Secondly, these countries benefit from relatively mild climatic conditions compared to other parts of the region which reduces the need for energy-intensive cooling and thus the total demand for electricity. The one exception to this pattern in the Levant is Iraq, whose economy relies on large hydrocarbon resources and electricity is heavily subsidized. However, economic development in recent decades has been strongly constrained by the political instability and armed conflicts. In North African countries, Egypt, Libya, Tunisia, and Morocco, national electrification programs in the 1970s, 1980s and 1990s dramatically improved access to electricity, especially in rural areas. Economic development and increasing incomes to households drove the penetration rates of appliances in residential homes which supported the sustained growth of per-capita electricity demand. In Egypt, energy-intensive industries were developed as they were encouraged by favorable government policy and low electricity tariff rates. This drove national consumption on a higher path compared to other North African countries such as Tunisia and Algeria. 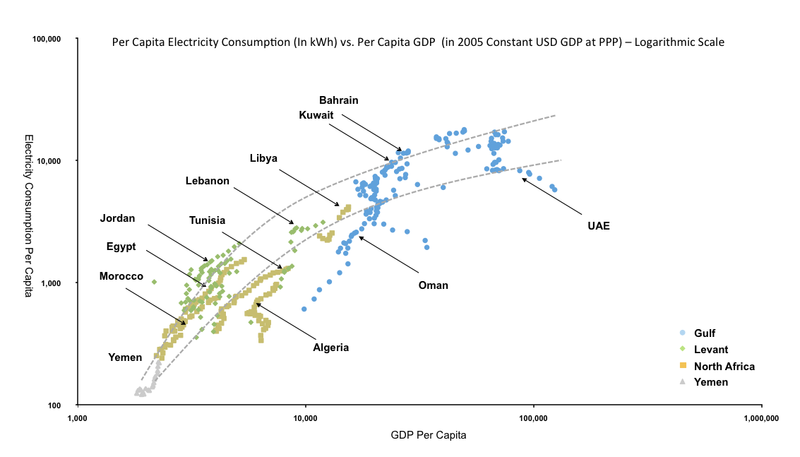 In the Gulf sub-region, the large availability of energy resources at heavily subsidized prices attracted investors and led to the development of energy-intensive industries such as steel, aluminum, and fertilizers across the region, which partly explains the higher levels of per-capita electricity demand at comparable levels of GDP with industrialized countries. Extreme hot-arid climate conditions have also contributed to domestic electricity consumption as they required extended use of cooling over longer periods of a year. In Saudi Arabia, it is estimated that cooling accounts for more than 70% of electricity consumed in the residential sector – representing approximately 40% of total annual electricity consumption in the kingdom. Favorable electricity tariffs to residential and commercial users and the lack of demand-side management initiatives have also exacerbated the magnitude of per-capita electricity demand growth by encouraging wasteful patterns of electricity consumption. The widespread development of energy-intensive water desalination across the Gulf region, has further added to the electricity load due to the use of energy-intensive thermal and membrane-based desalination processes. Thermal processes are dominant in the Gulf region and are usually coupled with power plants since some of the steam produced for power turbines can be diverted to desalinate water. This further drives fuel consumption at the power plant level. The energy intensity of water desalination is largely superior to traditional freshwater treatment in countries where sufficient freshwater resources are available (by a factor of 10 to 20 depending on technologies used), which helps explain why desalination represents a significant electricity load in the Gulf region. The IEA estimates that water desalination currently accounts for approximately 23% of all energy used in the UAE (which includes both electricity and fuel required to produce steam). Finally, the strong economic growth and the development of large scale residential and industrial projects also supported continued immigration into the region, especially in the Gulf Cooperation Council countries, ultimately leading to increased electricity demand. Yet while some national energy efficiency initiatives were launched across the Middle East, their scale remains limited. Saudi Arabia’s Energy Efficiency Centre focuses on reducing power through audits, load management, regulation and education; the United Arab Emirates launched a National Energy Efficiency and Conservation Program focusing on the residential sector. In Lebanon, the Lebanese Center for Energy Conservation funded by the United Nations Development Program has launched a number of individual initiatives but the country has yet to develop a comprehensive national program of the required scale. Data from the IEA suggests that carbon emissions intensity of the region’s electricity sector varies largely across its countries. 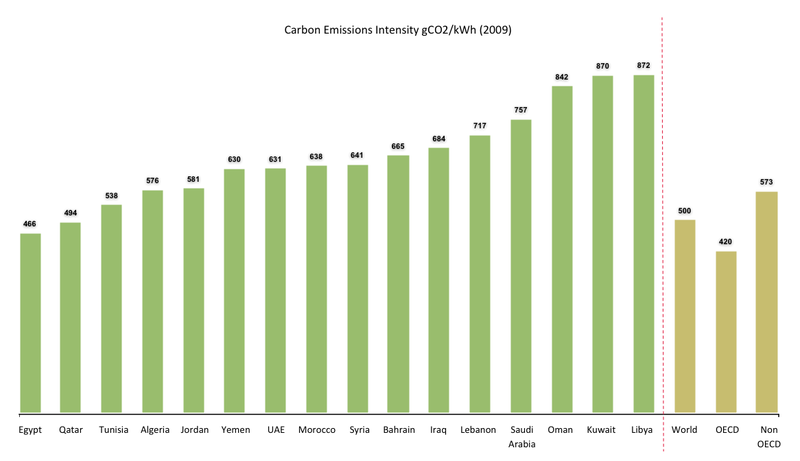 However, with the exception of Egypt and Qatar, all of these countries have emissions intensity above the world’s average of 500 kgCO2/kWh in 2009 (see figure 4). Such variations in the emissions intensity result from the choices of both fuel and technology mixes that were made in the different countries over the past years and decades. The fuel mix used to generate electricity is the main driver of carbon emissions intensity of electricity generation, i.e. the emissions of CO2 per unit of electricity generated. Renewable energy sources such as wind and solar, and nuclear power plants have very limited emissions from their operations compared to fossil fuel-based options. The carbon emissions intensities largely vary from one fossil fuel to another – natural gas has the lowest carbon footprint amongst these fuels while coal has the highest carbon footprint. In the Middle East and North Africa region, the electricity carbon emissions intensity is primarily determined by the mix of natural gas and oil-based fuels, especially as the share of renewables and nuclear power remains limited. Naturally, the mix between natural gas and oil based products is dictated by the availability of the hydrocarbon resources in the country, and by national policies on imports and exports. Countries with the lowest electricity carbon emissions intensity – Egypt, Qatar, Tunisia, Algeria, Jordan – have the largest share of natural gas of total electricity generated (56% in Egypt and upwards of 85% in Qatar). 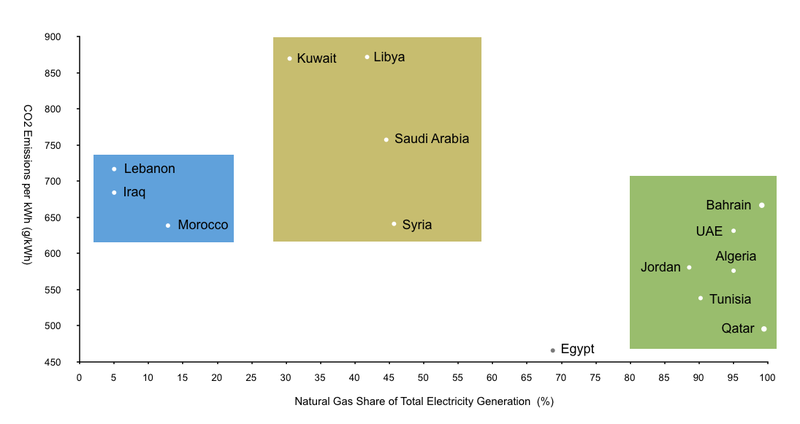 Both Egypt and Qatar rely on the large domestic production of natural gas to fuel their power plants. Despite its limited natural gas production, Jordan made the choice to develop gas-based electricity as it was able to secure sufficient natural gas volumes from Egypt through the Arab Gas Pipeline connection, linking both countries at convenient prices. The dependence of Jordan on Egyptian natural gas imports has recently encouraged the government to diversify its procurement of natural gas and consider LNG imports through a dedicated terminal (LNG can be procured from a large number of countries either through long-term contracts or on the markets). On the other side of the spectrum of electricity carbon emissions intensity are Lebanon, Iraq, Saudi Arabia, Kuwait, and Libya, which are the most reliant on oil-based fuels for their electricity generation. Motivated by the prospects of maximizing oil exports, Kuwait and Saudi Arabia had initially embarked on the development of gas-based electricity generation in order to save their oil for income-generating exports. However, the natural gas shortages the kingdom has recently experienced have driven it to revert to its reliance on oil-based alternatives. Both Kuwait and Saudi Arabia also experience shortages of fuel oil from their domestic refineries, which drives the use of crude oil in some of their power plants, especially during the summer seasons when demand peaks. With no natural gas resources, Lebanon mostly relies on oil products to fuel its thermal power plants with a limited share of hydro power generation. Although the country commissioned gas-based power plants, it was not able to secure sufficient natural gas resources and is now entirely reliant on the imports of oil products to generate its electricity (For more information refer to previous Carboun’s analysis of technical challenges in Lebanon). In Iraq, large volumes of natural gas – associated with crude oil production – are currently flared at oil wells. lacking the required infrastructure to evacuate produced natural gas and direct these volumes to existing gas-based power plants, Iraq has to rely on oil products and some volumes of crude oil instead. In addition to the fuel mix, technology is the other major determinant of electricity carbon emissions intensity. A number of electricity generation technologies are available to produce electricity from fossil fuels, mainly Open Cycle Gas Turbines, Combined Cycle Gas Turbines, and Steam Turbines. Different technologies vary differently in their performance efficiency. The more efficient a technology is, the less fuel it requires to generate a unit of electricity, and the less carbon it emits per unit of electricity produced (for the same fuel). The maximum efficiency level a technology can reach is limited by thermodynamic rules. Combined Cycle Gas Turbines are designed to recover wasted heat to support electricity production and can thus achieve relatively high efficiencies in the range of 50 – 60%. Open-cycle gas turbines typically only reach 40% of efficiency, while steam turbines used in coal and oil power plants have a typical efficiency of a mere 30%. Efficiency levels can also be impacted by the type of fuel used; the efficiency of Combined Cycle Gas Turbines which are designed to run on natural gas can be substantially degraded if gas were to be replaced with liquid fuels. Electricity generation in the region offers significant opportunities to reduce the emissions of the region. 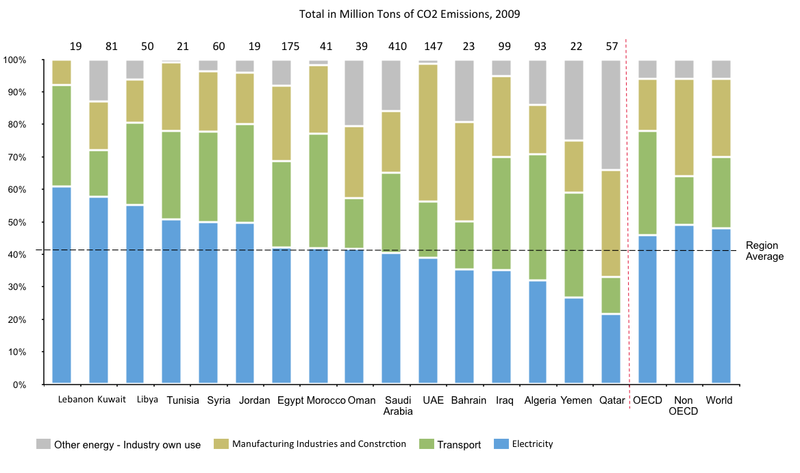 For example, if all electricity generated in the region in 2009 had the same level of Egypt’s carbon emissions intensity (466 gCO2/kWh), the region would have produced approximately 30% less Carbon emissions from the power sector, and thus have reduced its total carbon emissions by approximately 11%. Egypt achieves its relatively low electricity carbon emissions partly since two thirds of its electricity generation comes from natural gas and hydro power plans. Going forward, continued economic development will move countries of the region on the path of increased per-capita electricity demand, which combined with population growth, will drive demand for electricity upwards over the coming decades. Since electricity generation capacity is likely to be increased in line with demand, decisions that will be made regarding fuel and technology mixes for new power plants must be considered carefully as they will have an impact for decades after such plants are commissioned. The region’s countries have significant opportunities to reduce their carbon footprints by better planning the development of electricity generation capacity without compromising economic development. The electricity generation sectors across the region also have significant opportunities for improvements in energy efficiency and to ensure end-users are offered the same levels of service with lower consumption of electricity. Energy efficiency improvements can be applied both on the supply side – by replacing older power plants or choosing more efficient technologies – as well as on the demand side – by improving building codes to reduce cooling loads and by imposing efficiency standards for electronic appliances. Guy El Khoury is a management consultant based in Beirut with a focus on energy practice in the Middle East region. He can be reached at Guy [ a t ] Carboun [ d o t ] com. To discuss this article or the LebanON 24/7 project, please join Carboun’s vibrant discussion group on Linkedin. For news and updates on sustainability from around the region, join Carboun’s Facebook page or follow its Twitter feed.